No matter what your fitness level, the general benefits of swimming are yours to go out and grab and make your own. It has the power to give your muscles a makeover, transform you into a cardio king, turn back the clock, and calm you quicker than a secluded beach in the Bahamas. But if this isn’t enough to get you reaching for your cossie, here are our top benefits of swimming to show you there is no such thing as being too cool for the pool. Full body workout. Swimming uses all the muscles in the body so whether you swim a gentle breaststroke or hammer butterfly, you will get a full body workout. Plus, exercising in water makes your body work harder so 30 minutes in a pool is worth 45 minutes of the same activity on land. Great for general wellbeing. Just 30 minutes of swimming three times a week alongside a balanced, healthy diet and lifestyle is one of the best ways to stay fit and healthy and maintain a positive mental outlook. Do it with friends, and it’s even more fun! De-stresses and relaxes. Whether it’s work stressing you out, the kids being a nightmare, or just life in general, we all get times we just want to SCREAM. Well, help is at hand. Swimming regularly can lower stress levels, reduce anxiety and depression, and improve your sleep patterns. Feeling the mental benefits of swimming takes just a light swim. No lane pounding needed. Burns those calories. Swimming is one of the most effective ways to burn calories. A gentle swim can burn over 200 calories in just half an hour, more than double that of walking. And a faster swim would see that chocolate bar gone quicker than if you went running or cycling. Lowers the risk of diseases. As well as being a great form of cardiovascular exercise, swimming just 30 minutes a week can help to guard against heart disease, stroke and type 2 diabetes. Supports the body. Water supports up to 90 per cent of the body’s weight. So if you sprained an ankle at Monday night football or have a long term injury or illness, swimming is a brilliant way to stay active. Increases your energy levels. Inactivity and not ageing is often responsible for people’s lack of energy. Just 30 minutes of swimming three times per week can boost your energy levels through increased metabolic rate. Exercising without the sweat. If sweating puts you off other forms of exercise, fear not! As a swimmer, you’ll never feel sweaty no matter how hard you work because the water around you is constantly cooling you down. 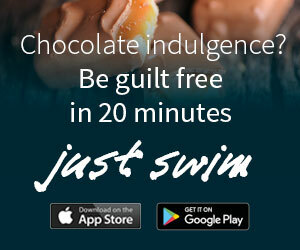 Burn calories swimming with the FREE Just Swim App.Click the image above to download.